Reviewing these three books for JASSS mainly means inviting social scientists to fruitfully include the spatial dimension in their simulation models. From the perspective of a reader used to spatial analysis but not to social simulation, the added value of the latter can become evident by reading articles published by this journal, and these three books can be a reference for technical solutions and for examples of nice and effective applications. But for the community of social scientists using simulations, some few words about the need for the spatial dimension and its modelling consequences are worth to be said before proceeding in reviewing the books. In recent times a strong need for the spatial dimension has emerged because of the application of social simulation for decision making. Many recent projects involving policy makers and stakeholders have shown that spatial and geographical data must be not only considered inside models but they must become elements of the model themselves, meaning that they are not only static and exogenous elements but active and interdependent ones. Such point can become evident with a simple example: a policy maker could ask us to make what-if and impact analysis of a particular set of policies, referring to a geographical area where such policy is planned to be applied. The area has peculiarities and, surely, neither is a flat and homogenous landscape nor the landscape will be untouched by proposed policies and by the derived effects on the society living in it. In these cases the need for the spatial dimension directly descends by the need for effective and trustable model results. Because of these cases, it is important that the community of social scientists continues in developing new tools and concepts to incorporate the spatial dimension in simulation models because of two main reasons: because those case-based models often refer to relevant dynamics of the target society, that is to say that the results of the model are capable to directly influence the welfare of the society living in the considered area; because the step of policy analysis and implementation can be considered as one of the most important test-beds for our work, where social simulation faces an important evaluation process being compared to alternative tools and results. My opinion is that if spatial dimension must be considered in case-based models for decision making because of the reasons just mentioned, that is not the only case, and we should be more used to consider it even in far more abstract and theoretical research projects. The spatial dimension, in fact, is neither separate nor can be always modelled just as differences in agents features and endowments or in social network positions. The spatial dimension is a crucial element of the complexity of societies, as crucial as the temporal one, even if soundly different. As Michael Batty points out in the last of the three books here considered, as we consider complexity-connected concepts such as equilibrium, self-organisation, transitions, bifurcations and so on about the temporal dimension, we should often do the same for the spatial one, exploiting concepts as scale, hierarchy, self-organisation, lock-ins and so forth. Moreover the two dimensions are not independent: history has shaped the landscape, and the landscape shapes the universe of possibilities for the future. To say it differently, spatial path-dependence and spatial lock-ins are not only typical of local development systems, such as technological clusters, but are a widespread feature of social phenomena. Interaction structures can be effectively modelled using network theory, but we know that the spatial dimension impacts on social networks defining the possibility of agents to communicate, meet and interact, but are the social needs for communication and interaction that are one of the most important forces driving the shaping of the landscape (at least in urban areas). Moreover, the spatial dimension affects our simulations even at the methodological level. For instance, the self-organisation patterns of the spatial dimension have a direct impact on the model determining opportunities and constraints to social agents, but they impact even the effectiveness of model validation procedures, such as sensitivity analysis, by better defining the feasible regions of the parameters space that we have to explore. Hoping to have caught the reader's attention on the relevance of the spatial dimension for social simulation, a few words must be added on the technological tools that can be used to consider such dimension and that are well introduced and exploited in these books. GIS (Geographic Information Systems) are a very relevant technological step forward in satisfying the need for an effective, fast and flexible tool for spatial analysis. Thus, the world of social simulation must keep an eye on the technological state of the art of such kind of software. 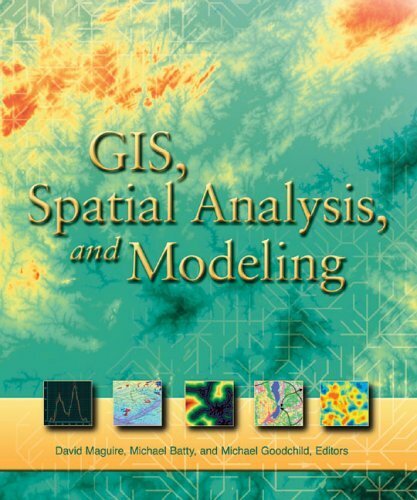 Secondly, GIS can be, in many different ways, integrated with simulations and these books (see below) offer many strategies and solutions to accomplish such task. Thirdly and finally, any kind of simulation can gain advantages in being integrated with spatial analysis tools, and in fact these books present applications exploiting cell-based simulations, agent-based simulations, micro-simulations and system dynamics. 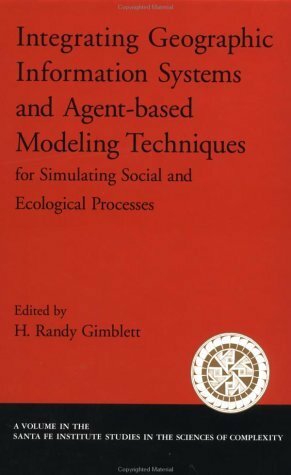 The book, as the title says, focuses on the integration of agent-based models and GIS, and the many applications that are presented take an environmental point of view, where the main interest is on ecological issues even if social processes are considered and modelled. It is a collection of works of several authors and its editor starts by reviewing experiences in object-oriented approaches and in spatially explicit individual-based models for solving ecological problems, from which the need for an integration of social and environmental dimensions to understand human/landscape interaction becomes evident. The spectrum of topics covered in the several chapters following the introduction is quite wide. The second chapter, for instance, discusses the possibility given by different kinds of agents architecture (architectures that differ not only because of the presence of cognitive structures, but also because they imply different kinds of actions depending on spatial constraints and on the social structures that interact with the spatial environment) in studying environmental processes and the human-land nexus. Chapter 9 touches close themes: how the modelling of autonomous intelligent agents can affect the analytic capability of social models that consider the spatial dimension. The other chapters present applications showing: the integration of GIS, agent-based models and cellular automata, pointing out how, from the point of view of agent-based modellers, the spatial dimension has been exploited in models as an exogenous and static element, and how historical and empirical data about the spatial dimension are often just constraining agents actions (chapter 3); different technological solutions in integrating modelling and analytical tools, and sample applications of the different strategies (chapter 4); policies about the control of parasitism over a landscape (chapter 5); long-run planning and effects on trophic levels in the Florida Everglades depending on different hydrologic scenarios (chapter 6); examples of spatial and temporal self-organisation in the cases of pedestrian movement, watershed dynamics and wildfire diffusion (chapter 8); simulation of wild-land recreation use with spatial interactions of agents in a canyon in Arizona (chapter 10) and in the Grand Canyon (chapter 11); land use change in the Brazilian Amazon, considering natural system and human institutions, and exploiting classifier systems for modelling human behaviour (chapter 12). In conclusion, summing up what has been just said and comparing it to the other two books, this book is particularly appealing for the reader interested in models that consider the environmental impacts of social dynamics, in the integration of non-commercial tools (e.g., Swarm and GRASS) and in the exploitation of intelligent agents. This book takes an explicit software centric point of view, but it as well presents many interesting applications. Moreover, even if it is published by ESRI Press, it is not bounded to the use of only commercial GIS tools. The editors start by writing the first three chapters which, as a whole, can be considered as an excellent introduction to the general issues about the integration of spatial analysis and modelling. For instance, in chapter 1, it is introduced a fundamental distinction between data models and processes models. It is often important to make clear the words we are using: if scholars working in social simulation have to co-work with spatial analysis experts, it is important allowing the latters to immediately understand that social simulation is about social processes modelling. Another important word introduced is 'spatial resolution', defined as the smallest geographical unit represented in the spatial database: such concept must enter in the social scientist lexicon for modelling tasks and beyond, for instance in qualitative and quantitative methods to collect empirical data for model calibration and validation. Other fundamental issues that are introduced concern the technological solutions for integrating GIS and modelling tools, as, for instance, the kinds of 'coupling' between different software and a continuum of technological solutions that ranges from more GIS-centric systems (where some modelling is added in a GIS platform) to more modelling-centric systems (where some of GIS technologies are put inside a modelling toolkit). Challenges posed by the integration are well stressed and they constitute a sort of agenda for future technological advances. The chapters in the second section of the book specifically deal with tools and techniques. Tools are introduced not only as sum of technicalities (for instance by theoretically defining concepts such as spatial correlation and regression), but also from the perspective of a modeller who wishes to learn to use such tools and needs to fully understand how they work, how the results can be verified, etc.. Thus, methodological issues are debated as they become evident in the presentation of technological solutions, and even here present challenges are well stressed. The following sections take a more application-oriented perspective. The seven chapters in section 3 deal in fact with socio-economic applications where issues derived from policy and decision making are always very relevant, and what-if analysis is often on focus. Topics range from urban growth to transportation models, from location planning to diffusion networks of diseases. Section 4 concerns environmental applications. From hydrologic modelling to a comparison of different ways for the empirical modelling of transition potentials of land-cover changes, from a case study of human and wild animals interactions in forests to spatial patterns for the optimisation of landscape design and planning, the seven chapters of this section, as well as the ones of the preceding section, are always interesting both because of the field of application and because they clearly present technical implementations, modelling and analytical pitfalls and solutions. In conclusion, this book is particularly of value for the reader interested in recent evolutions of technological solutions for spatial analysis and modelling, in the usage of commercial and non-commercial GIS, in applications related to the environment and to the planning of socio-economic issues like transportation, urban growth and activity location. This book presents a complexity approach for the studying of the emergence and evolution of cities. Urban phenomena are presented as bottom-up processes, and the reason for presenting this book together with the others is twofold: the author in facts keeps on focus the need to develop tools for planning and driving urban phenomena, recalling the need for social simulations that face the test-bed of policies; the book is full of interesting and useful examples of real applications, presenting tools and technological solutions in the direction of the integration of social simulation and spatial analysis. The book, moreover, does not provide new complete theories to explain or plan urban phenomena, but has an application and tool oriented perspective. The first chapter introduces some fundamental concepts about the complexity of the spatial dimension and then focuses on some well-known models concerning social and spatial phenomena (from Arthur to Schelling), that can be considered a good starting point for any researcher interested in a complexity-based approach to cities. The following three chapters focus on cell-based models (i.e., cellular automata, even extended ones), clearly introducing the tool and the mathematics underlying it, perfectly showing its usefulness in applications, and its limits too. Chapter 5 in facts starts by stressing the importance of introducing agents in models, when the research needs to overcome the limits posed by cell-based approaches. Some interesting models are then presented to testify how the introduction of agents in cell-based models can be graduated and dependent on analytical purposes. The following chapters present many models, grouped in different categories depending on their field of application. From models of local movement, like traffic models in streets and in public buildings such as the Tate Modern in London (chapter 5), to the emergence of systemic networks of cities (chapter 8), from urban growth dynamics (chapter 9) to issues related to the capability of urban self-organisation (i.e., urban structure evolution driven by bottom-up processes but without loosing coherence - chapter 10) and to rank, scale and size of cites as measures of a fractal geometry of urban phenomena (chapter 11), all topics are covered by clearly introducing and explaining both the case that is studied and the tools that are used. Moreover, a case of design and planning is presented (i.e., the route of the Notting Hill Carnival - chapter 7), where some further intriguing aspects of social simulation are discussed: for instance the possibility to generalise the knowledge developed in that specific case to the more generic category of small-scale spatial events. In the concluding chapter the author summarises the research presented in the book and presents some remarks that I personally consider crucial and worth to be further discussed not only in that particular field of research but in the whole community of social simulation. I am referring to the extensive exploitation of concepts such as steady states and sudden paths for studying complex systems far from equilibrium, to the difficulties of finding general simulation models that are also testable on empirical data, to a methodological approach that strongly stresses the relevance of parsimony, etc.. Such points enriches the book by introducing the reader to the most "hot" epistemological and methodological topics in our community and by making the approach adopted by the author evident, comprehensible and ready to be discussed. 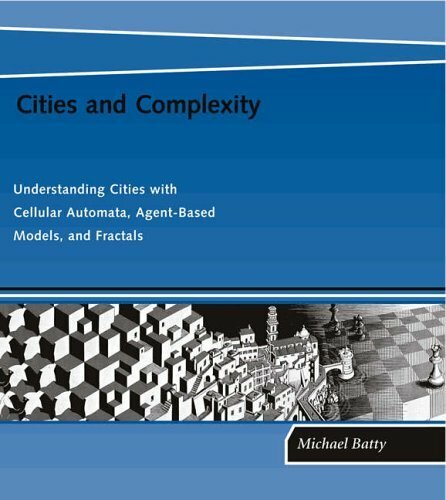 In conclusion this book is recommended for readers interested in urban studies, in social phenomena happening in urban contexts, in learning cell-based and agent-based modelling integrated with spatial analysis, and, in general, to those who are interested in the application of complexity to spatial phenomena.